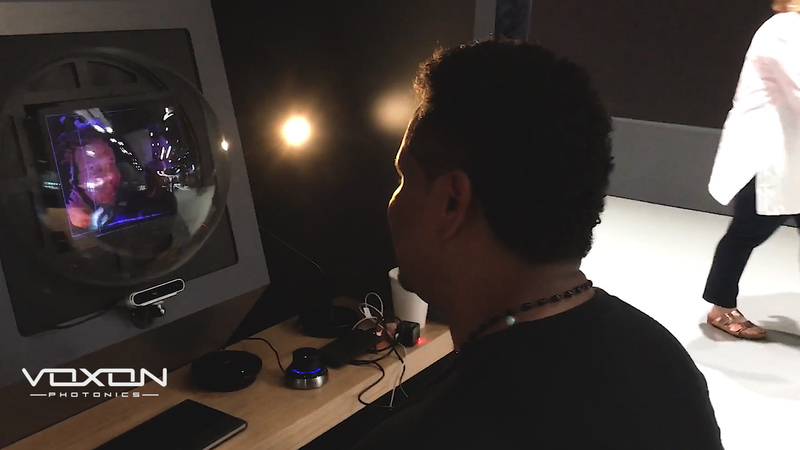 We were lucky enough to be involved with a world first recently… Voxon Photonics demonstrated its 3D, two-way volumetric video conferencing system (some may call it holographic) over a 5G network at the Mobile World Congress Americas 2018 event in Los Angeles in early September. When Verizon and Ericsson contacted us and asked if we could send volumetric video over a 5G connection, we really had no idea if it would be possible. Because volumetric data contains the entire volume of data in three dimensions, including the inside of objects, the bandwidth required really depends on the density, and complexity of the data. In traditional video encoding, compression codecs are used to compress the data, which loses detail that the human eye cannot see. When using compression with volumetric data, a great deal of care must be taken not to let the compression affect the position of each 3D data point. Too much compression and the resulting 3D object would appear distorted, and no compression would require extreme bandwidths. Fortunately for us, the bandwidth of the 5G network provided by Verizon and Ericsson was between 300 Megabits to 1 Gigabit per second. We set out to limit our bandwidth to 100 Megabits / Second so that we could run multiple streams simultaneously and not be impacted by other users of the network. In order to capture a real-time image of a person’s face, we used an Intel RealSense D415 camera. This camera has dual infrared sensors, a color sensor, a pattern projector, and an onboard high-speed processor that is able to create streaming depth images using stereophotogrammetry. We had never previously run our VX1 displays in a vertical orientation and had to make some minor modifications to ensure the display worked just the same. After designing some mockup up stands, we exported our design files from Fusion 360 and sent them to the US where the booth fabricators used them to design the supporting structure and external cladding for the 4 VX1 units that we would eventually ship to them. Over the next 12 weeks, we wrote and tested software that enabled both face to face holographic video conferencing, as well as remote sharing of a 3D medical image sourced from an MRI scanner. We tested the software on a very fast LAN and sent RealSense cameras to Verizon to test on their own network, using our software-based VX1 Simulator. Finally, we shipped 4 VX1 units to LA and boarded a plane for the USA. When we arrived at the Mobile World Congress conference, we simply unboxed our own VX1s and slotted them into place in the display booths. The demos went very well indeed and over the 3 days we had thousands of visitors experience the worlds face to face holographic video call over 5G network, or any network for that matter.